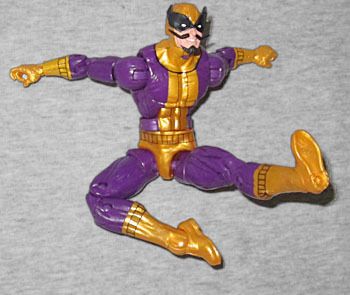 People often consider "Batroc ze Leapair" a lame, loser villain. Those people are wrong. That's right, a mercenary: Batroc is in it for money, not for evil. If the Avengers had a payroll, he'd be piloting Quinjets and taking monitor duty. He's so successful that in Batroc's first appearance, Captain America already knows him by reputation alone. He's repeatedly fought Cap (who, remember, is beyond the peak of human physical condition) to a standstill, and he's done it without guns or energy gauntlets or Cosmic Cubes - he's just really good at kicking. He's never beaten Cap, because, as Batroc himself has said, if there existed someone who could beat Captain America, there would be no Captain America. But still, Batroc fights him. Batroc stands and fights so the people who pay him have a chance to run away. And when he loses, he just smiles and shrugs. The guy is a badass. He's also Frencher than Pepe Le Pew. He's got the Maurice Chevalier accent, the "hohn hohn hohn" laugh, and just look at his ridiculous mustache! How do you put a sharp bend in a mustache?! There's a reason Gambit once charged up the ends and let them explode in Batroc's face. Batroc's mask started out as just a slightly flared domino, but has evolved into a full-on Wolverine over the years. The perfectly executed head is the only part of this figure that's new. He's the latest Marvel Legend to use Hasbro's "small" body, so all his costume details are simply painted on. That just means it's his classic incarnation, not the more modern look with the jacket instead of spandex - no big deal. His first appearances showed him in purple and orange, but that's been softened over the years to purple and gold, which is what this figure delivers. The purple is a lovely dark shade, and the gold is slightly metallic. There's even a nice match between the painted areas and the molded areas. His left hand is ready to clutch accessories, while his right hand has the trigger finger extended - not because he uses guns, but so he can twirl his mustache! The articulation is the same as other uses of this mold, which means you can get him into all sorts of fighting poses. He moves at the head, shoulders, biceps, elbows, wrists, torso, waist, hips, thighs, knees, shins and ankles. Of course, the hips still don't go out to a full 90° angle, which means this toy isn't as flexible as the real guy would be; remember, he was Jean-Claude Van Damme before Jean-Claude Van Damme was cool - he should be able to do the splits! On the plus side, he does have a hole in his back, so you can pose him in mid-leap if you have any old Doop stands hanging around. His Build-A-Figure piece is the torso and shoulder-banana of Thanos. Yes, they're packaged separately. Why? I don't know. 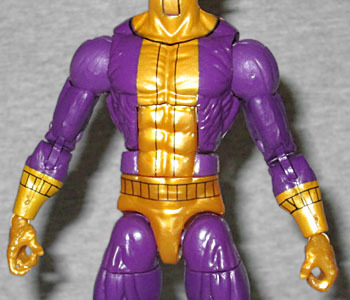 The armor has two small pegs that plug into the shoulders to keep it in place, but it won't be a permanent connection (if, for some reason, you want a more casual Thanos in your display). Georges Batroc doesn't get much respect, but consider this: the only difference between Batroc in the comics and Batroc in The Winter Soldier was the color of his pants and the length of his facial hair, and everybody thought the version in the movie was cool, right? Right. Even his overbearing Frenchiness is an affectation - he hams it up as part of his act, because he thinks it's funny, but is more reserved when thinking to himself. And "Batroc" definitely isn't a common surname; it seems to be derived from the adjective "batrachian" - in other words, "frog-like." The guy is a classic, and the fact that he's been turned into a Marvel Legend? C'est magnifique!